Three gang members have been jailed for the murder of 25-year-old Nigerian man Tobi Animashaun in Charlton, south east London. Jeremiah Lloyd Johnson, 23, of Walnut Road, E10; Codie Goodensimms, 22, of Fairthorn Road, SE7, Antoin Gray, 22 of Troughton Road, Charlton, were convicted and sentenced to life in prison on Wednesday, 10 May after an eight-week trial at the Old Bailey. The court heard how on Sunday, 11 September 2016 Tobi (pictured above) went to his place of work, Sanisbury's Supermarkets Distribution Centre in Anchor and Hope Lane, Charlton. He had finished work and came out of the depot at around 19:45hrs. Witnesses described how three cars full of young males had parked outside the front gates. As Tobi walked out he was approached by at least one of the men from the car who started to speak to him. Witnesses heard the conversation was around Tobi working and whether he was still part of 'Road Life'. The group then attacked Tobi without warning. They were armed with various weapons, which included knives, machetes and a baseball bat. During the course of the assault Tobi was stabbed a number of time including one wound to his abdomen and another to his heart. One of the attackers, who was armed with a knife, also threatened the members of the public who were witnessing the horrifying assault. After the attack the gang made off in the three cars. Officers and London Ambulance Service attended, and Tobi was taken to a south London hospital. Despite all the efforts of medical staff, Tobi died the following morning, Monday 12 September. A post-mortem examination on Tuesday, 13 September, at Greenwich Mortuary gave his cause of death as result of the stab wounds to chest and abdomen. An investigation began by officers from the Homicide and Major Crime Command and it quickly became apparent the motive for the attack was gang related. The victim had been a member of a rival gang from Thamesmead, southeast London, and there was a history of violence between these two rival gangs. However Tobi had left the gang, started work and began to build a new life for himself. Witnesses, phone enquiries and forensic evidence recovered at the scene and in the vehicles the gang used, resulted in suspects being identified. On Friday, 16 September [A] Jeremiah Lloyd Johnson and [B] Codie Goodensimms, were arrested in connection with the investigation. Both were later charged with Tobi's murder: Johnson being charged on Sunday, 18 September and Goodensimms being charged on 29 November. On Tuesday, 11 October [D] Antoin Gray was arrested on suspicion of murder. He was subsequently charged with Tobi's murder on Wednesday, 19 October. 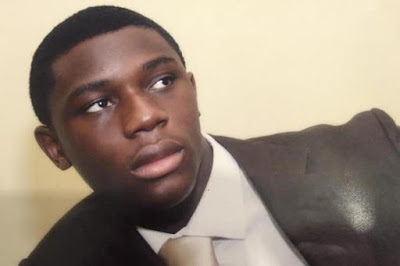 "This case is all the more tragic as Tobi was on a new and positive path. He had got a job and was working to make a new life for himself, away from the pernicious influence of gang culture. "Tobi was the victim of a planned attack that was savage, cowardly and remorseless. These men armed themselves with weapons, waited for Tobi, and then murdered him in front of horrified members of the public, who they also threatened. "Tobi's family has been left bereft by this wanton act of violence. These men have now been made to face the responsibly for their actions. They will face many years in prison to reflect on their violent actions of that day." "I still remember the day quite vividly. It was a September afternoon when I received a phone call saying my brother had been stabbed and was being rushed to hospital. "At that stage I had no idea how badly he was injured until I got to the hospital. When I arrived I wasn’t able to see him because he was being taken to surgery. "After an agonising wait I found out there was nothing they could to save my brother’s life. The next time I saw my brother was in the mortuary, seeing his lifeless body haunts me even now. The image constantly keeps me up at night. I haven’t had a full nights sleep since it happened. "My mum and dad are keeping it together but I can see the sadness behind their eyes. To lose a child, let alone their first born is something no parent should ever experience. Yet they stay strong for Sarah and I. "Tobi was a young man; he was only 25-years-old. Tobi was my older brother, my best friend and my hero. He was the most loving, funny and caring person who was taken from us too soon. "Tobi got into trouble in his youth and went to prison for 6 months. The time he spent in prison seemed to change him for the better. When he came out he got himself a job, was going to college and making plans for his future. My only solace is that I saw this reformed Tobi before he died. Although he had gotten into trouble in his youth this should not have cost him his life. "Not once throughout this trial have I seen any of the defendants show any remorse or guilt for what they have done. They have taken a vital and beloved member of our family and all our lives will never be the same again."